In March 2000, Jim Gardner asked me to give a lecture at the meeting of the International Magnolia Society in Dublin the following year. He suggested that I should speak on the Climatic Zone 9 plants that I grow in my garden at Earlscliffe, Baily, Co. Dublin at 53º north latitude. On learning during a second telephone conversation in February 2001 that my garden was experiencing one of the coldest winters since I started taking records 31 years ago and that many plants had been killed, he suggested that I speak instead on 'Plant hardiness'. So I want to look at the hardiness of Climatic Zone 9 plants in Ireland and at low temperature damage generally. I imagine that most people will know that the idea of climatic hardiness zones was first developed for the US and has been extended to the rest of the world. Climatic zones 1 to 9 are based on the average of the absolute minimum temperature over a 20 year period. Climatic zones give an indication of how hardy a plant is, they are not perfect but they are a good place to begin. The whole subject is extremely complex as many other factors are involved in plant survival. The main factor influencing plant hardiness is the absolute minimum temperature - but this is only one of many factors. Other factors include the duration of freezing temperatures, the speed of drop, the hardening up process, the speed of thaw, the moisture content of the plant, the soil and the air, the soil type. Healthy, well grown plants will be better able to cope with cold than unhealthy plants so that a very wide range of other cultural factors come into play, including nutrition, plant health and general husbandry. The morphology of the plants also plays a part with some plants having especially susceptible stem, buds or roots. In addition there are other climatic factors such as wind chill and depth of snow cover. There is still much argument among scientists about the physiological basis of cold injury. Freezing injury can be caused by intracellular freezing of the cell contents or indirectly by dehydration of tissues resulting from extracellular freezing. 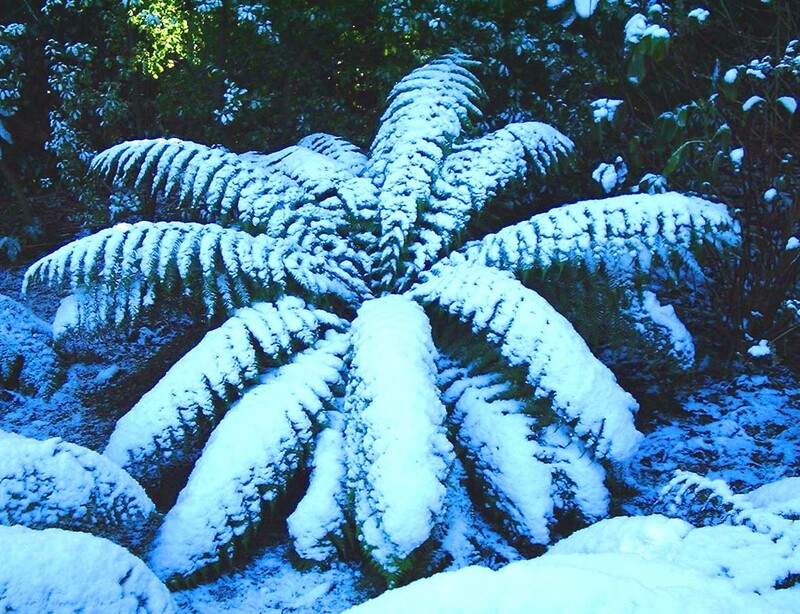 Plants usually are killed by formation of ice crystals within the cells but formation of ice crystals in the intercellular spaces between cells is not necessarily fatal. If frost hardened plants are cooled slowly ice initially forms in the intercellular spaces and as the temperature decreases, water moves out of the cells to these ice nuclei. As a result the concentration of the cell sap is increased and, it was once thought that this accounted for the lowering of the freezing point. It is now believed that this effect is small and it now seems that in the more hardy species, the plant tissue avoids freezing by deep supercooling to temperatures of - 20 C or less. Other workers have placed emphasis on the structural nature of protein molecules when water is withdrawn from the cell during the formation of intercellular ice crystals. It has been suggested that the accumulation of solutes within the cell at low temperatures may prevent the denaturing and aggregation of proteins, by osmotic retention of water. This applies not only to proteins within the cell but also to those incorporated in the surrounding protoplasmic membrane. If proteins associated with the membrane were irreversibly damaged, there would be loss of semipermeability and death of the cell. If frost hardened plants are cooled rapidly they are often injured, possibly because water does not move out of the cells rapidly enough and intracellular freezing suddenly occurs. Killing by intracellular freezing may be due to mechanical disruption of the protoplasm or alternatively to dehydration. Freezing injury can take many forms, such as killing back of shoots, formation of frost rings, injury to stem or roots, frost heaving. Frost cracks and winter sunscald lesions sometimes develop on stems of thin barked trees when alternated freezing and thawing occur during the winter. Lesions recognised by dead bark patches, Sometimes bark peels back to reveal wood or by sunken cankers which become sites for fungal attack. These lesions damage the phloem so that the downward translocation of organic solutes is impeded. Bark on south side may be 20º C warmer at midday that the bark on the north side, suggesting that the south side undergoes violent temperature fluctuations. Heating of the south side may initiated changes that decrease the cold hardiness of the cambium and make it very susceptible to frost injury. Stem tissues are hardier than root tissue, but roots are injured less in winter because the soil and snow cover protects them to some extent from exposure to freezing temperatures. Nevertheless when soil freezes roots are often damaged, especially the small physiologically important ones. The location of roots in the soil is important both with regard to plant health and also freezing injury. As soil management in my garden is virtually entirely by means of herbicides and the soil surface is not disturbed, plant roots are close to the surface. Many plants that self seed, such as Solanum laciniatum never put down roots deeper than 2 cm so that the entire root system is right at the soil surface. This would suggest that root injury would be especially serious in my garden, as the surface soil at least was frozen during the severe cold spell but in general this has not been the case. A large number of roots were examined about 7 weeks after the severe cold spell and as far as could be ascertained root damage was minimal compared with the severe injury to the top parts of the plants. In some cases it was clear that both top and root were damaged e.g. Europys chrysanthemoides and Aeonium but in many cases, although the top was seriously affected, the roots appear turgid, moist and fresh. 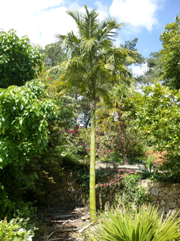 Plants in this latter category were Solanum laciniatum, Cyathea cooperi, Psoralea affinis, P. pinnata, Tetrapanax papyfera, Eucalyptus ficifolia. It is clear from the way so many plants resprout strongly from the base, perhaps 6 months or one year after the top growth has been entirely killed that in many plants the Achilles heel is not the roots as far as low temperature injury is concerned. It has been suggested that roots develop frost resistance only to temperatures ranging from about - 2 to - 10C. Frost hardiness of roots varies with species and rootstock . Cold injury to roots appears to be worse in sandy than in clay soils. I have> found it fascinating wandering round the garden seeing the many different ways that plants show low temperature injury. 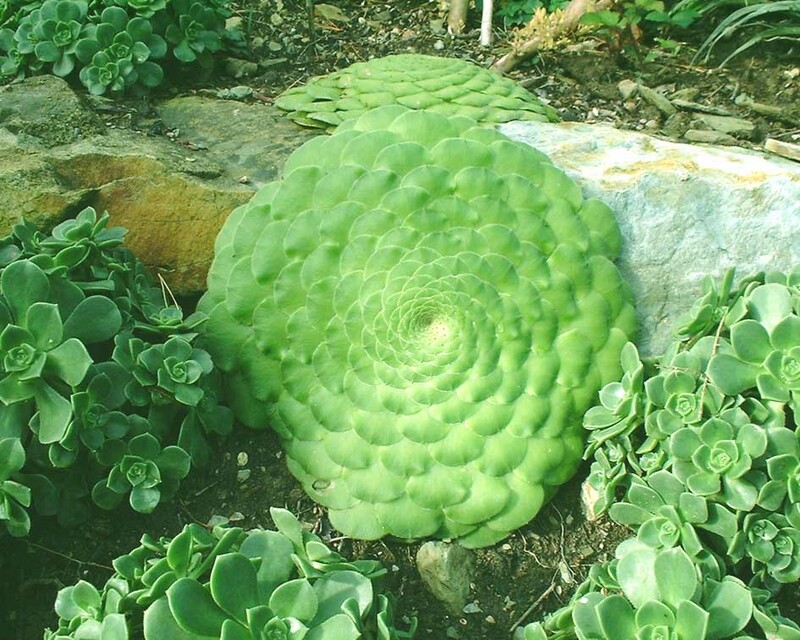 Some show up damage immediately after the first severe frost say -4 or -5 C. Such plants include Aeonium tabuliforme and a number of other succulents. 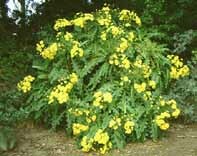 These plants grow in low rainfall areas and they contain exceptionally large quantities of water. The appearance of a water soaked condition the morning after a cold night suggest that the cell structure has broken down either because of damage to the cell walls or to the nature of the semipermeable membrane surrounding the cells. Within a short time it is hard to recognize the amorphous mass as a plant at all. Another plant that goes quickly at about - 5 C is Brugmansia sanguineum. Where the temperature doesn’t fall below - 5, the plant stems remain intact although flowers and leaves will be damaged, and the plant can grow up to 4 or 5 metres in height. Although this year the stem looks damaged, if previous experience can be relied on the plant will sprout from the base. In contrast to these plants where damage is rapid, E. ficifolia looks fine for some weeks after the frost. Certainly he shoot tips which remain active during a normal winter will be killed early on but after a severe frost, the leaves will remain, apparently in good> condition for some weeks before eventually turning a deep brown colour. The cambium, phloem and xylem of the stem structure appears killed but the roots 7 weeks afterwards were alive. During the growing season plants have little ability to withstand frost, but killing frosts don't usually occur during this period. With approach of autumn changes occur in the plant which give it a degree of hardiness. Further increase in hardiness occurs during the winter. The problem with many zone 9 plants is that they don't recognise the signs that winter is approaching such as the shortening days of autumn, they don’t' stop growing and they don't start acquiring any real degree of hardiness. In Ireland 's mild climate it is these erratic changes in winter temperature that are potentially damaging. Frost damage itself is still debated. It is agreed that water is present in plant tissue in two main fractions - in the cell wall and in the cell itself in the protoplast and vacuole. Ice forms first in the cell walls and water moves out of the protoplasm and through the cell membrane and adds to this accumulation. As the temperature falls lower, death point is reached. This is where argument starts. One group believes that ice crystals form in the protoplast and disrupt its functioning while the other group believe that the continuing movement of water out of the protoplast induces a level of dehydration that disrupts it. Some plants develop considerable tolerance. It is clear that considerable physiological changes are taking place in plants during the period we think of them as dormant. 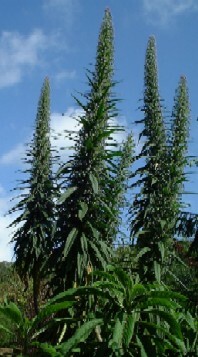 Net result of changes determine the extent to which plants are able to cope. So it is not possible to look back at records and say what plant will stand up to what level of frost. There are too many permutations of mild and cold spells for any confident predictions. We can't control the weather but we can do something to increase plant hardiness.> For instance, much could be done to increase the hardiness of climatic zone 9 plants to Irish conditions both by selection and by breeding. For example, Eucalyptus ficifolia flowered well at Earlscliffe between September and November 1976 but trees were killed by frost during the 1976/77 winter. This species does not usually survive temperatures lower than - 1 to - 4 ° C. The brilliant red blossom and attractive leaves with reddish mid-rib and margin made the flowering plant in 1976 the most attractive tree I have ever seen and the memory of it encouraged me to attempt to find a hardier clone at the first opportunity (see* below). This did not arrive until January/February 1996 when my wife and I set off for Western Australia specifically to collect seed of E. ficifolia in the 'coldest' area possible and to learn something about hybridising Eucalyptus at the University of Western Australia , Nedlands, Perth . Having got the necessary licence to collect seed for scientific purposes from the Department of Conservation and Land Management (CALM) in Perth we set off for the south coast. Unlike many eucalyptus species, E. ficifolia has a very restricted range and occurs naturally in only two small areas - inland about 30 miles north east from the town of Walpole near Mount Frankland and right on the coast about nine miles east of Walpole. The area near Mount Frankland would be less than 300 metres above sea level so that there might not be a great difference in the harshness of the climate between the two areas. Seed was also collected from trees that had been planted in other colder parts of Western Australia . Having travelled about 11,000 miles by air and 300 miles by car, it was an exciting moment spotting the first E.ficifolia tree, standing about 8 metres high with a great dome of brilliant red flowers on the top along with a good crop of seed from last year's flowers. Unfortunately this first tree had an unbranched trunk to about 3 metres and I found it impossible to climb so we had to travel further in search of more accessible seed. Capsules were collected from both wild areas and the large seed was rapidly extracted by allowing the capsules to dry in a glasshouse. The outside ambient temperature was over 40° C most days. I envisaged that if I planted out large numbers of seedlings closely together at Earlscliffe, the first winter would kill most of them (seedlings are usually most susceptible in their first season) and, with some luck, leave me with one or two hardier plants that could be multiplied by tissue culture. 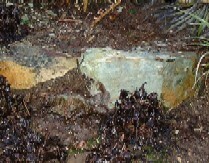 The seed was sown at Earlscliffe in cold glass in April 1996 and germinated readily. Some seedlings were planted out in autumn and the majority in spring 1997. Paradoxically, none of the seedlings outside has been killed (1995/6 was the last cold winter) but I lost just under 50% of seedlings over wintered under glass in the first season, probably due to Phytophthora. 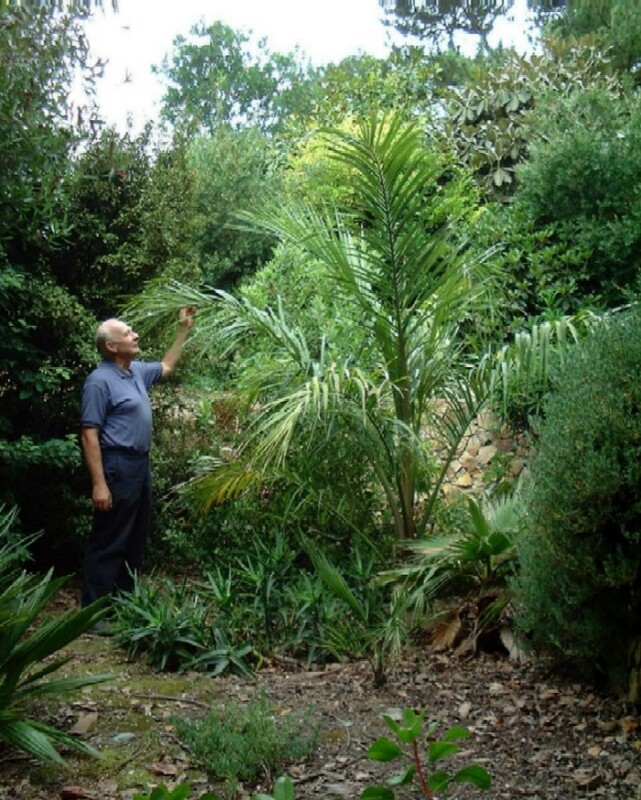 In December 2000, I had over 100 young plants some over 3 metres tall, all planted too closely together (about 18 cm apart), none of which has yet flowered but all looked in very good condition. The frost of late December 2000 and February/March has taken its toll but one or two plants may have survived. Plants have been distributed to other locations including Fota and Malahide Castle . * I am also attempting to hybridise but ficifolia will not cross with gunnii or pulverulenta. Red flowered caesia will and I have obtained pollen from Western Australia and done some crossing but the pollen was weak on arrival. I have a tree of caesia at Glasnevin and I hope to get fresh pollen from it as soon as it flowers and continue. The Giant Borage is obviously not native to Co Dublin, yet this plant, Echium pininana has made itself completely at home here. With its enormous, triffid like spire, unusual leaf form and unbranching structure it makes a powerful statement in any landscape or garden. The Giant Borage comes from the Canary Islands yet paradoxically, it is a highly endangered species in its native land. Like foxglove, it is monocarpic, meaning that it flowers and seeds only once (monocarpic comes from mono meaning once and carpel a seed). Whenever the plant decides to flower. 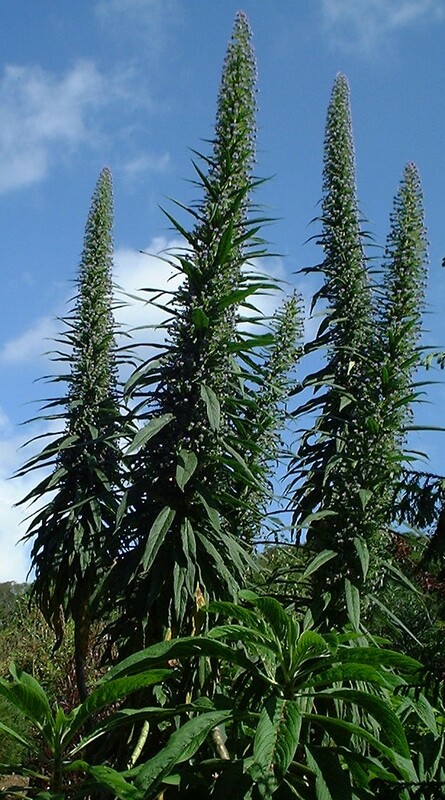 either in its first, second or third year, every bit of energy in the plant goes to produce this amazing 20 foot high flowering spike and at the end of the year, the plant is depleted of energy and it dies exhausted. Even in death, there is a certain sad beauty about this dignified corpse. In its native land, the giant Borage grows on harsh volcanic slopes so it's not used to an affluent lifestyle. A good sized borage can produce I million seed and the way they carpet the ground with seedlings every seed seems to be fertile. You don't even have to thin out the seedlings for the most vigorous kill the weaker and the plants self select. 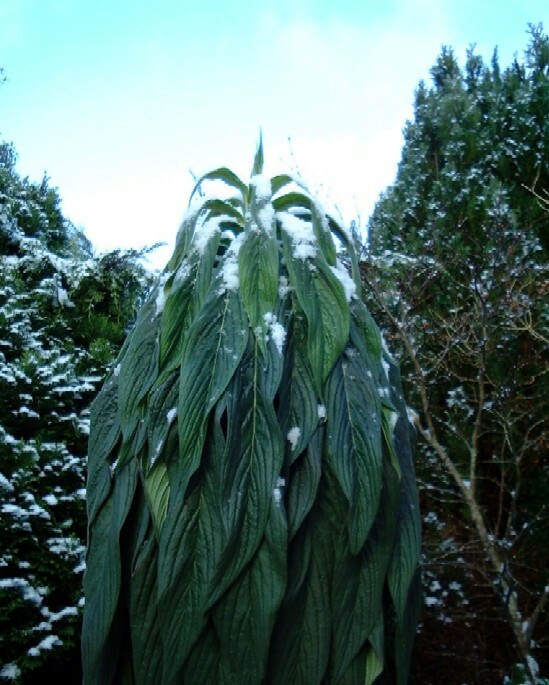 In my early days of gardening at Earlscliffe, a cold winter e.g. 1978/79 and 1986/87 killed all the Echium seedlings in my garden. The much harder winters of 1995/6 and 2000/01 have not. It appears that a hardier form is evolving. This is not surprising as in some winters a proportion of the seedlings will die. So seed is only being shed from the surviving plants and it may be that a hardier form is evolving. 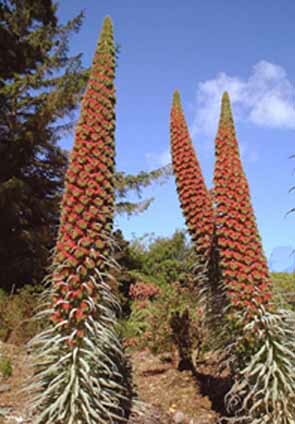 Here is a related species, the red Borage, Echium wilpretii, which is even more attractive but less vigorous and does not self seed. I collected seed for these spires from one parent plant in late 1998, sowed it in spring 1999. The plant makes a woolly ball the first year and flowers in the second. And here is an interloper that arose from a seed from the same parent. Obviously a bee must have carried a pollen grain from the Giant Borage to the Red Borage and this is a hybrid or cross between the two. The hybrid nature of this plant is obvious as it is intermediate in height between its father and mother, and intermediate in flower density between the two and its carmine/ purplish flower colour is a mix of the blue flowers of its father and red of its mother. Between April and mid June the Giant Borage grows at 2 inches (50cm) a day. Then on the longest day its upward surge stops abruptly and it gets on with the job of dispersing its seed. The hybrid E wilpretii x E. pininana appears to be hardier than either of its parents, as it doesn't shrivel up in the cold as much as E. pininana. E. nervosum appears to be very sensitive to cold as two plants were killed in the past winter. 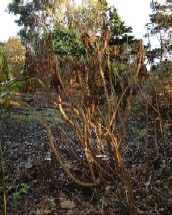 E. candicans also appears to be susceptible and is looking very sick at present. Given the diversity of plant response to low temperature and the diversity of Irish weather patterns, it is not surprising that it is so difficult to identify the precise reasons for the seemingly erratic winter injury to tender plants. Where the temperature drops rapidly to a very low level you can have direct injury where the contents of the cell freezes before water can move out into the intercellular space. In this case death of the plant tissue is rapid. Or you can have indirect damage where so much water moves out that the cell contents dehydrate, in this case it seems that death is much prolonged. When dealing with virtually any aspect of plant growth, we should consider the whole plant - but seldom do, It is unfortunate that when we look at a small tree, this is what we see. It would be so much better if we could see the whole plant and the whole plant is very much involved in plant hardiness. Because of my research interest in chemical weed control, I have always had a special interest in roots. Some plants die very slowly e.g. Psoralea pinnata. Presumably this is due to dehydration of the cell contents because the appearance of the dead plant just looks as if it was dehydrated. It is interesting to observe how plants killed or damaged by low temperatures respond in a wide variety of ways. While scientists continue to argue about the exact way plants are damaged by frost, there is general agreement that cells are killed if ice crystals are formed within them. 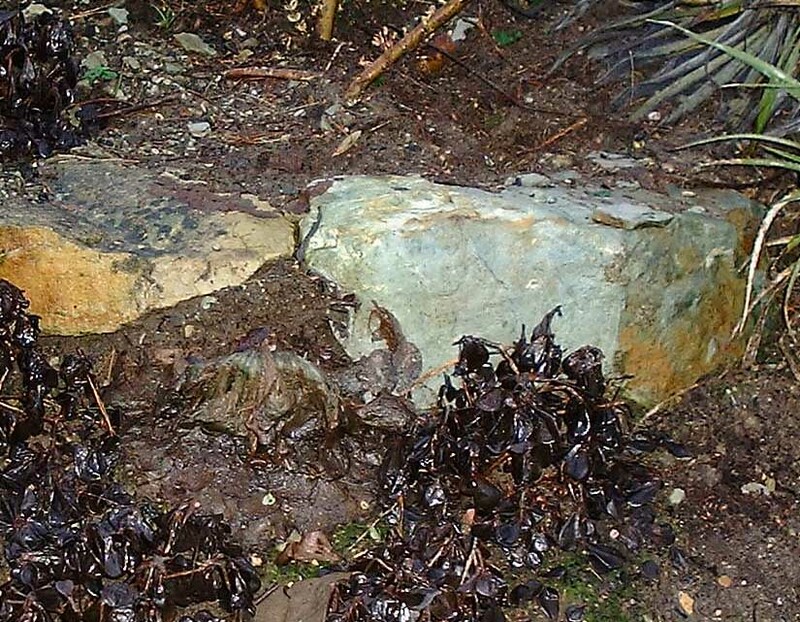 But not all plants that collapse quickly during a period of low temperature are killed as many recover. 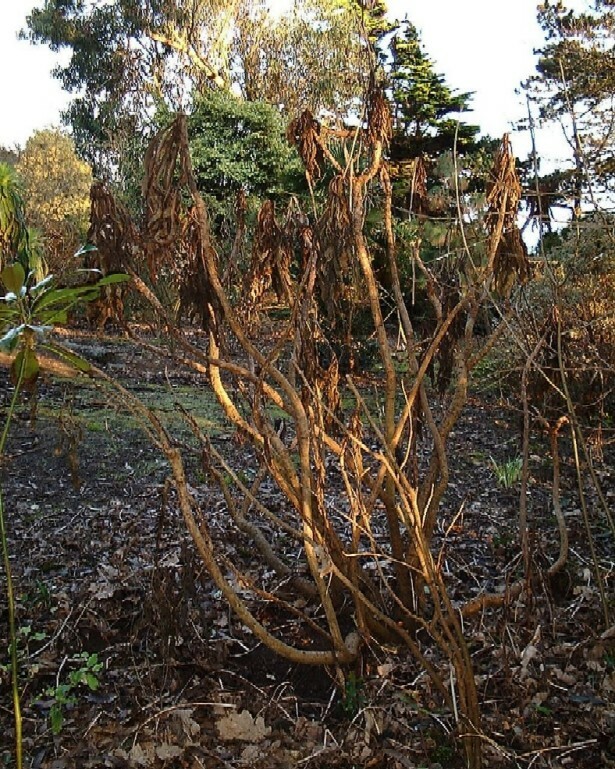 Conversely, some plants can look in reasonable condition for over a month after the freeze only to die later in the year. To conclude, the basic method of frost hardiness is not fully understood but hardening is accompanied by one or more of the following changes. Tissue may become capable in some way of limited the location of extra cellular ice formation to where it can cause least damage. There is frequently an increase in the dissolved substances in the cell sap, frequently sugars or amino acids, which rather than having a simple anti-freeze effect, are thought likely to protect specific sensitive proteins and enzymes from the effect of freezing. Lastly, plant cells may possess a degree of dehydration tolerance, the basis of which is not fully understood, but which may include the limitation of cell and vacuole size and the synthesis of desiccation resistant proteins on hardening.